1 OPTIION SENSATION 25€ turn around, wing-over, to put your head off ! very funny and magical ! 1 OPTION SENSATION 25€ turn around, wing-over, to put your head off ! very funny and magical ! 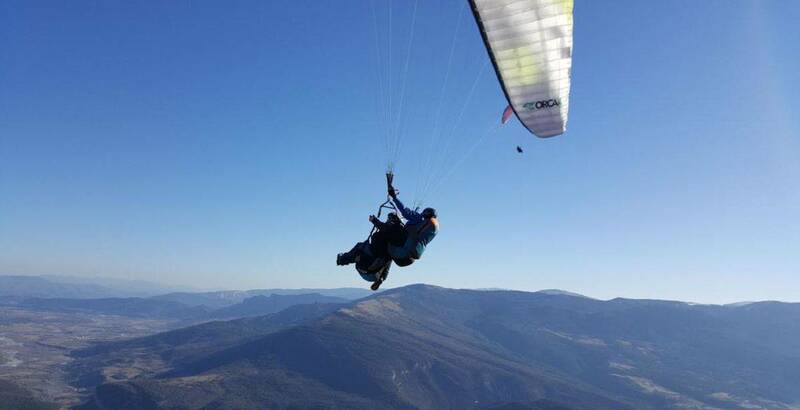 Situated at 1400 meters above sea level, the Montagne de Chabre offers a stunning panoramic view of Mont Ventoux to the bar of the ecrins that will give you a taste of your baptism in paragliding. The experience really begins when you run to fly. You will experience a magical moment when your feet leave the ground. You then fly over the whole valley of the Buech or the meouge with a magnificent panorama of Sisteron to the Pic de Bure, top of the valley. You enjoy flying like a bird, the dream of every human being. FLIGHT FIRST: for the first times. He(it) lasts between 10 and 20 min according to the conditions, matter(count) 15 minutes on average... It is the flight(theft) of the first times and the children, in the morning in quiet conditions. You will overfly(skim through) the valley of the méouge or the buech, by sliding in the air, with symbolic valley of the durance in bottom of screen! FLIGHT FUL FLYING: for the amateurs of a little more serious sensations, the flight duration is between 30 and 45 min, to see a little more according to your desires ! You will steal in thermal conditions, will exploit the air, and especially your eyes will not believe their ears!!! The silence, the noise of the wind, and the fantastic view over the valley of the durance, and the mythical massifs des écrins, dévoluy, vercors... Everything is in reach up our Chabre mountain. Finally our "sensations" option, which will allow you the time of a moment, to put the "head upside down", with turns, 360, and sensations of incredible sliding! Within safety margins, of course! Our equipment corresponds to European standards, the paragliders are certified, equipped with emergency parachute (compulsory ), and our istructors are experienced and state graduates. Our team takes full charge of you, from the premises of our school, to the south exit of the village of Laragne, until take-off. Our places : Montagne de Chabre ( Laragne ), Mison ( 10 min ) in the evening, St Geniez ( Sisteron ), La Longeagne ( Aspres sur Buech ), St Vincent les Forts ( in mistral weather, the site is located above Serre-Ponçon Lake. We use the Chabre site in Laragne as a priority, but for reasons of practicality or weather, we can visit the other sites! After your flight in paragliding, we will take you back to the local, or you will return with your accompaniers if you have any! Beverage and drinking services at our agency. Good physical fitness. If possible no cardiac or bone handicap. Any known physical or physiological problems should be reported to the Instructor prior to the flight, who will make the decision on the passenger’s carriage. Do not hesitate to contact us (for any questions or questions) by phone. We always fly when the conditions are adapted to the airship.